Hi, I’m Brooke and I live in La Grange Park, Illinois, a suburb west of Chicago. I’ve been married to my husband, Josh, for 11 years and we have two daughters and an old mutt named Sadie, who we lovingly refer to as our Chicago brown dog. We left our beloved city a few years ago and live in a 1950’s Cape Cod across from a forest preserve which gives us new beauty with each passing season. I work two afternoons a week as a special education teacher providing reading remediation at a clinic and am fortunate to stay home with our girls the rest of the week. I love decorating our home, cooking healthy meals for my family and friends, relaxing with my husband in the evenings (if I’m lucky, with a cocktail because he has become quite the at-home mixologist), traveling, and taking family outings. I love spaces with mid-century style and gravitate towards masculine décor and furniture. I love white walls and painted all of my rooms white except the bedrooms as soon as we moved into our home. I like bringing color into our home through art and accessories and love a good vintage Turkish rug. I am drawn to simplicity in our home, partly out of necessity. Our house is modest in size and we have tried to maximize our space wherever possible. Like many people, I was inspired when I read The Life Changing Magic of Tidying Up by Marie Kondo and we have tried to live by the philosophy of less is more. I have tried to eliminate items that do not spark joy or serve some function. A liveable, comfortable, child-friendly house is also deeply important to me. I want our home to feel put together but never stuffy, so there are elements of my children mixed into the design of every room. I try to guide the styling in my daughters’ bedrooms, but they’re their own people and have opinions about what they like. You’ll find a feather collection taped to the wall of my oldest daughter’s room and her necklaces lovingly hung over a pair of deer antlers. My younger daughter is just 3, but I expect that in a couple of years she’ll have strong opinions, too. 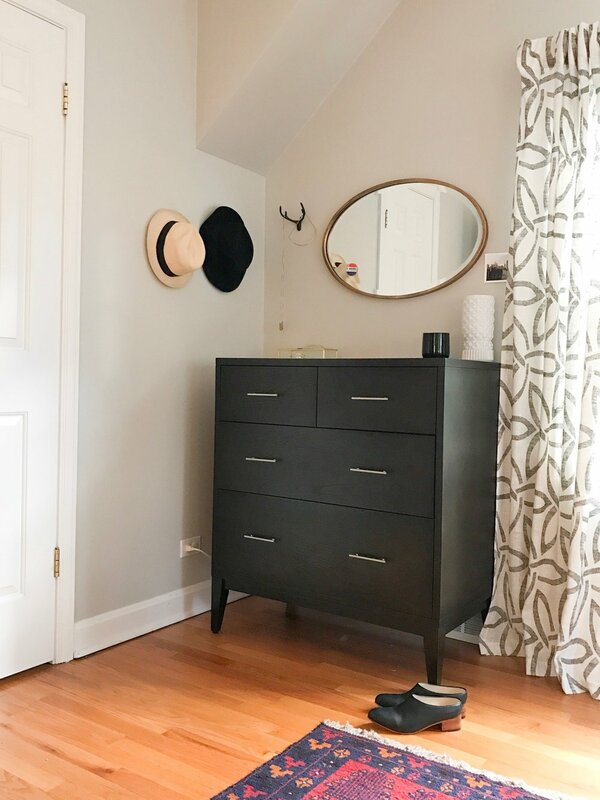 I’ve worked intentionally to let go of wanting my girls’ rooms to look like something out of a catalog and have embraced the way decorating allows them to use their own creative spirits. I like to think of design as evolving. I don’t like to think of a room as being done; over time and with different experiences, a space organically changes. I love that about home. How would you describe your family's values (or family culture)? We certainly value togetherness and are happiest when we’re out enjoying what Chicago has to offer. We believe in kindness and investing our time in relationships so we’re often busy with playdates or dinners with friends and family We believe in helping others fiscally and through service and have found a lovely church community in which to serve. We value education and learning through experiences and the classroom. Our children do leave for school, but we have a word wall in our kitchen, a bird’s nest lovingly displayed on our mantel, and an old letterpress board where we use the niches to display treasures the kids find when adventuring outsides. I enjoy having my space organized, which can be incredibly challenging when raising children. Kids’ toys can easily take over a space and I found that happening within the first few years of my first born's life. I was drawn to the idea of having less in part because it meant less organizing and cleaning for me. I’ve tried hard to be thoughtful about the toys I bring into the house, striving to acquire toys made of natural materials and ones that encourage creative play. I recently read Simplicity Parenting and loved the idea of allowing our children to learn with less. In terms of my own consumption, I found myself impulsively buying extras during trips to Target or the mall and was finding that much of what I bought needed to be refreshed frequently and it became exhausting. I now try to think about what I need or want before purchasing anything so that I can buy better things but with a much smaller quantity than before. I love walking into my closet now and loving everything I see and knowing that items in my home will be with us for many years to come. I love the intimacy our home affords. When I’m home during the days with my girls, I’m able to hear them from just about anywhere. Our house is cozy and inviting, which is a comfort for an introvert like me. I love the way the smell of a good meal wafts through the whole house; I love the afternoon light that streams in through our front window on sunny afternoons; I love sitting on the screened in porch and watching the girls play in our yard. I feel lucky to have such a lovely home to raise my girls in. Brooke is a stay at home mom dabbling in minimalist home design. She enjoys a home that is layered with meaningful pieces that bring with them stories of beautiful experiences.